Designed to support a MCL/LCL injury and protect the knee. Is the DonJoy Economy Hinged Knee right for me? Whether you have a MCL/LCL injury or general knee pain due to mild arthritis, previous meniscus tear, contusions or patella instability, the DonJoy Economy Hinged Knee delivers light support to the knee during daily activities, twisting and side to side movements. Designed with unexposed, padded hinges, this brace is ideal for individuals who don't want to wear a rigid brace or for athletes who participate in sports that aren't allowed to wear one, like wrestling, rugby or youth soccer. Offered in a wraparound or sleeve option, the DonJoy Economy Hinge Knee brace is designed to give your knee mild medial-lateral stability. The wraparound style makes it easy to fit any size/shape leg. This brace is ideal for individuals with mild MCL, LCL or PCL injuries, arthritis, previous meniscus tear, contusions or patella instability. It's also suitable for people who've had surgery on their knee recently and athletes who participate in contact sports. The neoprene and drytex (only available with the wraparound style) material makes this brace breathable and comfortable for all-day wear. Can be ordered with a popliteal cutout behind the knee where the brace material has been removed in an oval cutout to reduce bunching up of material behind the knee. After usage, we recommend you remove the uprights, then rinse with fresh, clean water and let it air dry. View all DonJoy knee braces or our full selection of MCL/LCL braces. I want to know whether the Economy Hinged Knee Brace can be helpful in preventing Hyperextension. 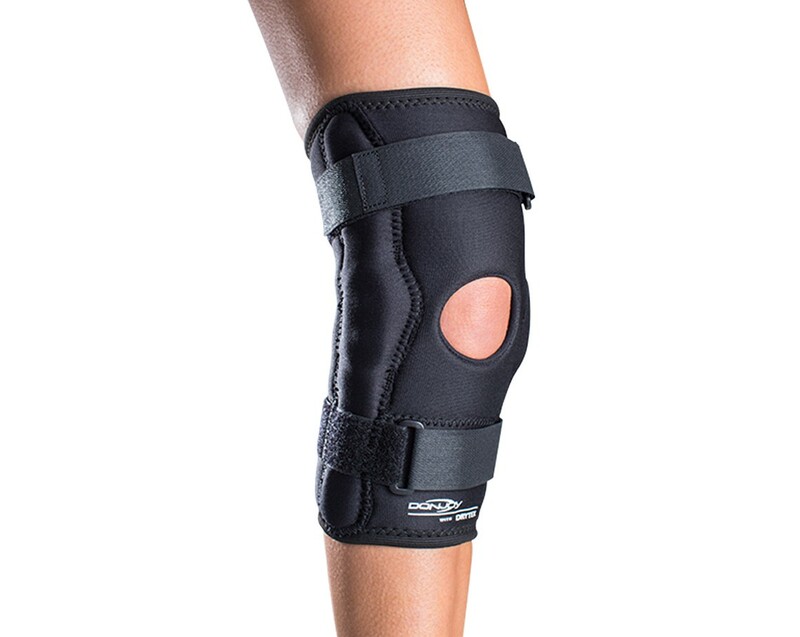 The Economy hinged knee brace ships with a 10 degree extension stop installed in the hinged. This feature prevents hyperextension, and is removable if not desired. The DonJoy Economy Hinged Knee can be worn on either leg. what is the difference between a open or closed popliteal and a sleeve or wrap around for this brace? The popliteal space is located behind the knee so the brace can either come with an opening in that area or can be closed. A sleeve is slid up over the foot and ankle to the knee and the wrap around has velcro closures in front so the brace wraps around the leg and is closed by that velcro in the front of the leg. I have an old ACL injury and I have yet to have surgery to correct it. It is completely gone and I am looking for a brace to help as much as possible while I exercise. Although I know there is no brace that will completely support my knee, what brace would be best when working out? The most Cardio I am able to do is the elliptical! The Playmaker II knee brace will offer mild to moderate support for the knee and is still not as bulky as a rigid knee brace. A brace like this sould give you enough support for doing an activity such as the elliptical. I recently hyperextended my knee and my old brace broke, so I am looking for a new brace. I am unsure what size to get! I recently had reconstructive surgery on my ACL and meniscus. Which knee brace would you recommend for playing basketball? Preferably one that is less than $100? Hi, I have a 20.5" thigh, 16" knee, and 16" calf. What size do you recommend ? Not sure what size to go with? I'm trying to understand the ordering options. Does the Sleeve option also have straps? Which option would be better for soccer, wrap around or sleeve? Both the sleeve and the wrap around have straps but if you ae playing soccer in the brace it would be best to get the sleeve. Since you will be doing a lot of running in the brace the sleeve would stay up better on the leg. I had an ACL reconstruction in 2005 and unfortunately tore the graft & medial meniscus recently. I will be undergoing surgery in December 2015. While my orthopedist provided a brace to restrict movement post-surgery, the material and make of the brace do not seem too great. I am looking to purchase a brace to be worn when I am active to prevent re-injury (after I wear the brace provided for 4 weeks post-surgery to restrict movement). After doing some research, my understanding of my options are as follows: (1) Economy Hinged Knee Brace, (2) Deluxe Hinged Knee brace, (3) Playmaker II, (4) Playmaker II with Fourcepoint hinge and (5) Reaction Web knee brace. Is that accurate? And which brace would you recommend for running / hiking / plyometric exercises? My knee measurements are: knee 12 1//8, above 16 1/4, below 11 3/8. Should I order XS or S of the wrap around Donjoy Economy Hinged Knee Brace? I am and equestrian and have a torn ACL and medial meniscus. I am also in my mid 50s and have not decided as to whether I will have surgery or not. I am buying a Playmaker II for barn work, but I am also looking for a brace with a mild support to wear over my breeches while riding. I only ride dressage (no jumping or putting weight in the stirrups) and do not want anything that will "get in the way" or rub my saddle. You are on the right track with the DonJoy Economy Hinged Knee will give you a more mild to somewhat moderate level of support for your ACL and meniscus, and because the hinges are located on the inside of the brace, they should not cause any damage to your saddle or discomfort to you. I have had surgery on my knee to repair a torn meniscus, and since have suffered chronic knee pain, and weakness. would this be a good brace? I have had my left knee reconstructed and medial meniscus removed. I have re-torn the ACL and am looking for a brace to stabilize my knee when being active with aerobics, walking etc. Would you recommend this for someone with my knee? Since you re-tore your ACL you will need to wear a rigid ACL brace for activities such as aerobics. The Don Joy Full Force Ligament knee brace is light weight, low profile and has our patented Fource Point hinge for ACL protection. https://www.betterbraces.com/donjoy-fullfource-ligament-knee-brace A simple hinged knee brace will not give you the protection that you need. Do you have any knee braces like this one that are not hinged? Was advised to select a medium size, after 3 weeks plus of wear I find that a small would have been better as the medium size stretched. I would guess that after that much use I could not return for a smaller size?? Exact same brace that I got from my doctor but much cheaper. I like the brace for the most part but it is not as durable as I would like. My first one I have had to repair in several places. The enclosed area which contains the metal side braces tore through after only having it a short time which allowed the metal to come outside the padding. I was able to make one repair to close the tear in the fabric. The other thing that could use improvement on this brace is the stitching on the velcro. This is another item I have had to restitch as the seam started coming loose. Another design issue they could improve on is the fact it has a tendency to slide down the leg. Perhaps the company could find a solution to that too. I very much like the enclosed hinge idea. This eliminates the Velcro problem I ALWAYS have with the exposed pivot point style. My only complaints are the straps only attach at one point which tends to leave me fiddling with the lower one over my foot. The real area that could use improvement is the hinge sleeve needs reinforcing at the ends. The top of the inside hinge sleeve wore through fairly quickly leaving the end of the hinge to jab me in the leg. Ouch. Love it and would recommend! Love the brace! I have an MCL strain, the brace gives me confidence while working out. Anyone that has had one it takes a long time to heal and even longer for the mental to go away. Love the way I can wrap the brace on and off. I had the sleeve and it was miserable to take on and off daily. Great quality and good design. My issue is the straps. It is very hard to make it tight enough to stay on. If the straps went through a buckle and pulled back to velcro closed it would be a great design. Very helpful customer support. Brace has been very helpful! I bought this brace for my knee 2 or 3 times in the past. I liked the design of the brace but the hinges have a tendency to tear through the end of the fabric. It did this about 3 days after I bought it. The brace I bought this time was not stitched nearly as well as the ones I bought in the past in this same model. I have had to reinforce each end with strips of fabric to keep the hinges from poking out. The quality of this brace has really gone down from others I have had in the past even though the would do the same thing after wearing them a while. It does provide good support and I do like the velcro closure and open back. I think the company needs to work on fabric and stitching improvements at the ends of the metal hinges. If they would do this I would give it an excellent rating. The one I got from the company looked like one that had been returned once already and I probably should have sent it back when it started coming unstitched. If it happens to another one again it will be returned if I buy another one. Pros: Good support and adjustable with open back. Lighter than most others. Cons: Very poor quality stitching and fabric at the ends of the metal hinges. Started coming apart after 3 days use. If you can't repair it don't buy it. It's a somewhat good product. If it would have not torn. I purchased to wear (temporarily I hope) under my hockey gear. It worked well and was nowhere near as cumbersome as I'd feared it would be. Pros: Stable, strong and surprisingly comfortable. Also lightweight and worked under hockey shin guards.